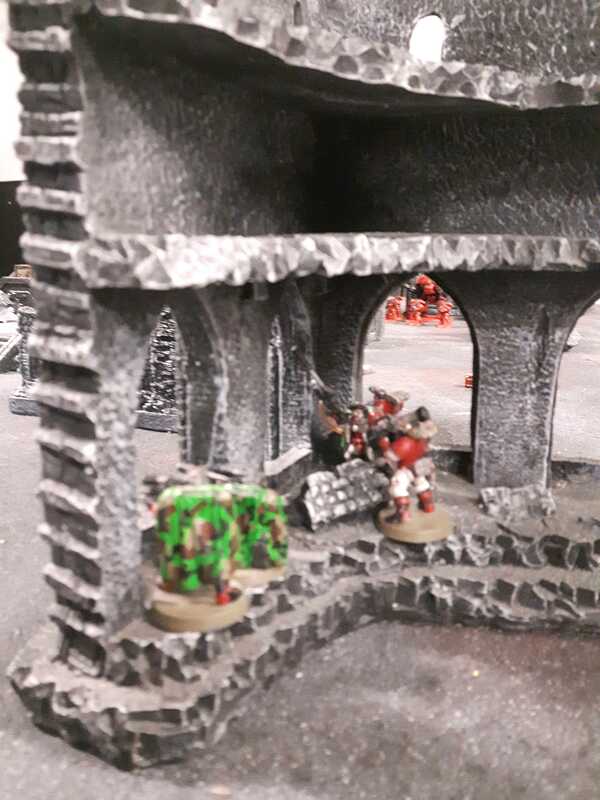 The battle for Neo Eboracum had been raging for a month before the Blood Angels had arrived, and had left left roughly ninety percent of the city a devastated husk. The PDF had been bled white by the jagged knife-thrust of the Drukhari onslaught, and the city’s population had been reduced to a few scattered survivors hiding amidst the rubble of their homes. 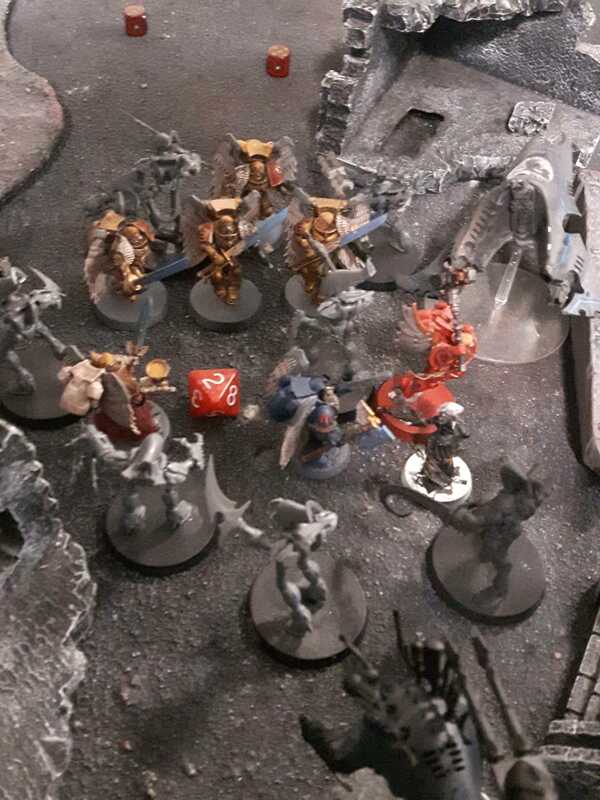 The Drukhari had been on the verge of annihilating the remaining PDF forces when the Blood Angels had arrived, striking back at the Drukhari with the force of a thunderbolt and shattering them on their moment of victory. Now the treacherous xenos had slunk back into the ruins of the city, licking their wounds, harrying and raiding Imperial forces instead of committing to battle. The war had now turned into a game of cat and mouse, with the Sons of Sanguinius and the Eldar raiders engaged in running skirmishes and hit and run battles against one another in the city’s ruined streets. It was a game that would continue until one side or the other committed to an all out assault. His vision suddenly began to blur, his twin hearts began to race, and he felt a horrible dryness and the taste of copper in the back of his throat. He held his needle rifle tightly and clenched his teeth, trying to shut out the urge to rend, to kill, to destroy. Not today, he told himself, digging into reserves of iron will to push the curse back. Not while his Scouts needed him. His vision returned to normal at that moment, the pounding in his chest and his temples subsiding. He hoped none of his Scouts had seen the momentary tension that had creased into his face: he needed them to be confident in him if they were to survive, to learn, and to become full-fledged Blood Angels. Below the ruined hab, Amadeo could see the strike force getting into position, search lights and helm-lenses piercing the rain-drenched gloom as they set up a firebase in the ruined city square. Some of the new Primaris reinforcements to the Chapter were already performing weapons checks on their massive plasma incinerators, while behind them, Brother Sanctian raised both the arms of his Dreadnought chassis, his twin rotary cannons spinning with barely checked aggression. This was but a lure, Amadeo knew, a show of force daring the Drukhari to come at them. The trap had been set: he made a few quick hand gestures to his Scouts, and they immediately dropped down into hiding positions along the windows of the ruined hab. Across the city block, he knew, other Scout squads were doing the same thing, lying in wait for the Drukhari’s arrival. Then, at the edge of his hearing, he heard it: a faint, keening wail, like that of a waste-revenant of Baalite myth. It was the unmistakable sound that the Drukhari’s nimble, bladed skimmers made whenever they were approaching at high speed. The fiends had taken the bait. They were coming. “Ready weapons,” Amadeo whispered, calmly attaching the the scope of his needle rifle while his squad did the same, taking up sniping positions while Artan slotted a krak missile into his launcher. Artan, Tyrio, Vigilio, Morleus…all had their flaws, but all had the makings of fine Astartes as well. Emperor willing, they would all survive this battle to become so. 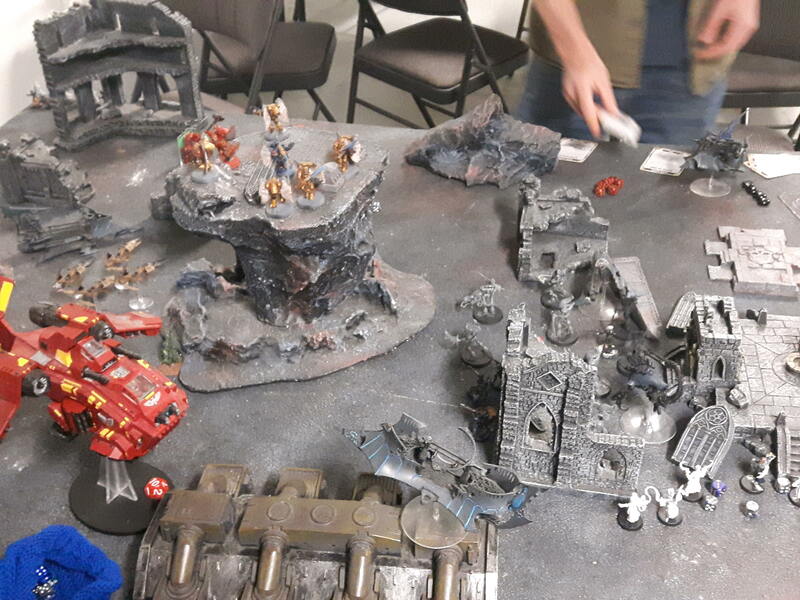 A while back, I managed to get a game of 40k in at one of my local game stores against a Blood Angels player who was recently returning to 40k. Going in, I was admittedly a little apprehensive, as the last time I had faced Blood Angels, my Sisters of Battle had been soundly thrashed. This time, however, I was taking my Drukhari, and this time I was a little more prepared for the Angels’ speed and close combat power. You’ll note that I’m actually behind by slightly more than 130 points. In the original draft of my list, I was actually bringing a Battalion for my Kabal force and more Kabalites mounted in an extra Raider. And guess what genius left his other Archon, and most of his Kabalites, back home? I couldn’t think of what to use to fill in the gap in such short notice, so I just did what I could with me very poor mental math when I got there. Anyway, in this list, I wanted to try out some new units, particularly the Grotesques/Talos, and hopefully the new model curse wouldn’t be too debilitating. 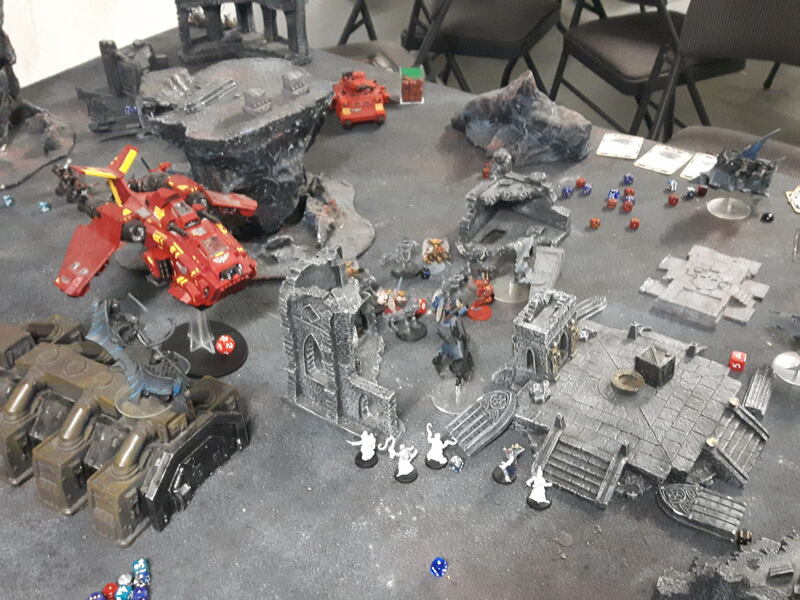 Otherwise, I brought a balance of shooting and close combat power…even though a small part of my brain was telling me that fighting Blood Angels in close combat was a bad idea). Note: this batrep will feature a lot of unpainted minis. You have my sincerest apologies, readers, I have been quite lazy when it comes to painting my stuff. I will try to make this the last time I use unpainted stuff in a batrep. As expected, the dreaded Captain Smash was coming out to play, along with aome equally scary Sanguinary Guard and some pretty potent shooting units. This game was going to be a tough one. If you squint a little, you can maaaaybe see something that isn’t a blurry mess. We had 6 objectives spread across the table. My forces (which are difficult to see, partly due to the blurriness of this pic and partly due to my army’s grey paint scheme) I had my Wyches deploy in their raider, along with Karath and Khyrus, on the far left flank along with my Reavers and Razorwing, while my Coven units and Venoms occupied the centre and my Ravagers hung further behind. 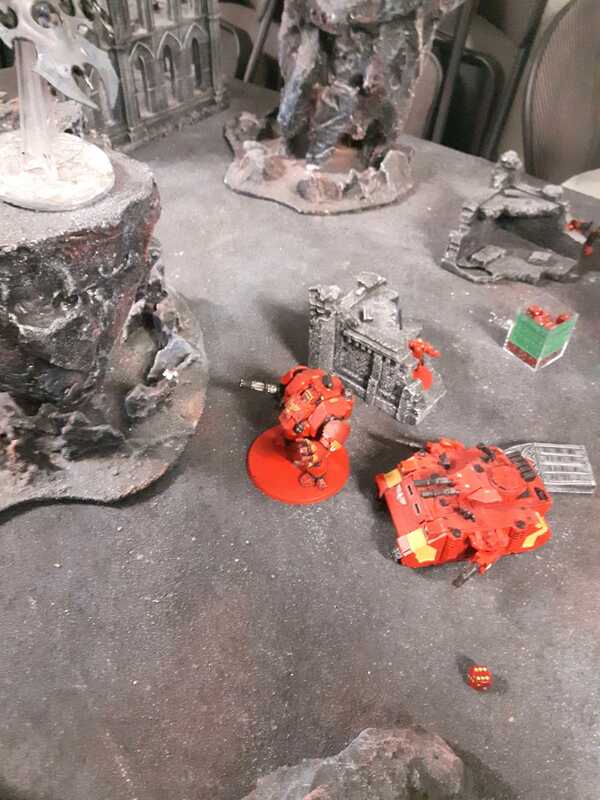 On the Blood Angels side, my opponent set up a solid firebase of Hellblasters, his Predator and his Redemptor, with is Lieutenant hanging back to provide rerolls to wound. One unit of close combat Scouts hung behind his lines, and one unit of Snipers hid in the upper level of a building to the far right of his side. His other two Scout units hid in the buildings next to my own deployment zone. His Sanguinary Priest and Death Company were mounted up in his Stormraven, while his Captain, Librarian and Sanguinary Guard were held in reserve. Going into this game, my plan was to deal with his shooting units as early as possible before isolating/neutralizing his close combat stuff. I didn’t think I had anything that could deal with Captain Smash or his Golden Boys in close combat, and if I couldn’t get rid of them with shooting, my best bet was to tie them up with my Grotesques and mob them with as many of my own close combat units and characters as possible. After deployment, I won the roll off, my opponent failed to seize the initiative, and the game began. In my first turn, I drew Secure Objective 4 (which was not too far from my deployment zone), Critical Objective 1 (which was at the back of my opponent’s zone) and Witch Hunter…which was going to be impossible to achieve this turn on account of no witches being on the board. Starting the turn, my immediate priority was to eliminate as much of the Blood Angels firepower as possible. 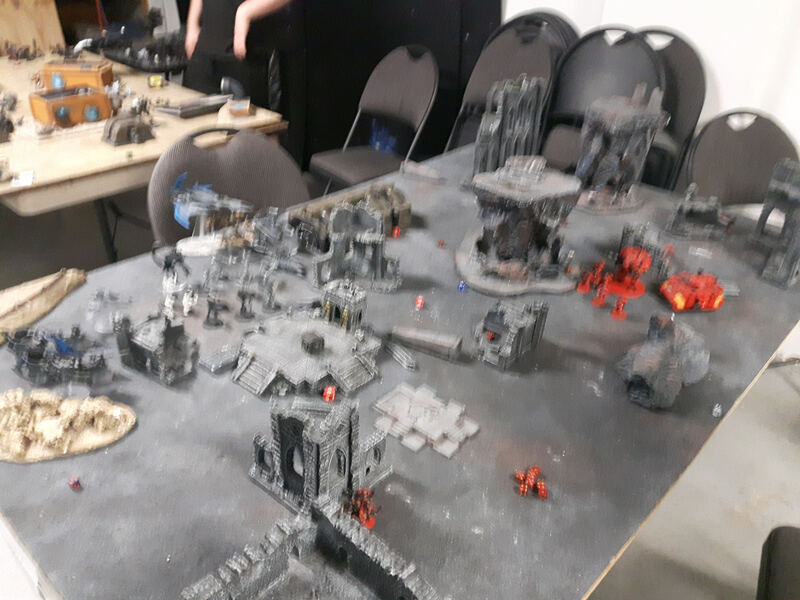 In the movement phase, my rightmost Ravager zoomed to the right of the board grab Objective 4 (taking him close to the Blood Angel Scouts in the process), while my other Ravager and two of my Venoms zoomed up to get into rapid fire/blaster range of the Hellblasters. (In my haste I had forgotten to move my third Venom– possibly because it was still unpainted at the time). On the left flank, my Reavers advanced so they were at the foot of the building the Scouts were ensconced in, and my Raider moved to the side of the giant rock formation in the centre, waiting for the right moment to unleash Wyches on something. The Razorwing flew directly on top of said rock formation to get line of sight on those Hellblasters. Finally, the Coven units advanced relentlessly towards the middle of the board, presenting a formidable wall of wraithbone and twisted flesh for the Blood Angels to batter themselves against. In the shooting phase, the Razorwing dove down on the Hellblasters, unleashing screaming death on them and wiping out two of them its disintegrators and missiles, before its splinter cannon poisoned a wound off of a third. One of my Kabalite squads then fired at them, finishing off the wounded one with splinters before freeming another with their blaster. 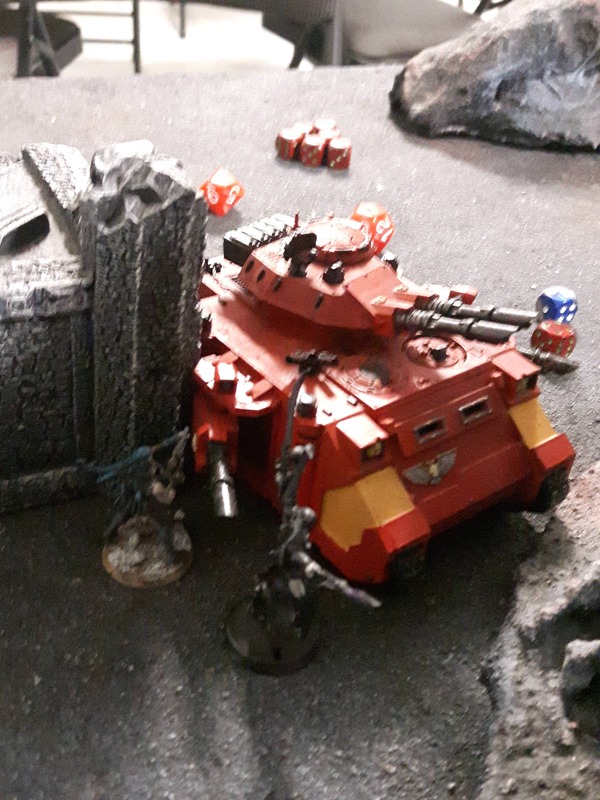 The last Hellblaster didn’t even have time to swear vengeance before the Kabalites’ Venom opened fire and mowed him down in a hail of splinters, netting me First Blood, and, more importantly, getting rid of the very scary Hellblasters on turn 1. The rest of my army, thanks to my inability to guess distances, was woefully out of range of the Predator (the other unit I was really scared of), and so instead another Venom and its Kabalite crew and both of my Ravagers fired on the Redemptor Dreadnought. My dice were on fire, and after the storm of splinters and darklight subsided, I had actually managed to drop the big lug down to 3 wounds! (Three unsaved wounds were even scored on it by splinter fire!) The Wych Raider then fired a sneaky side shot from around the rock formation at the Predator…and failed to wound it. Ah well. In in the charge phase, my Reavers tried a long charge at the unit of Scouts in the building…and not only failed their charge (despite rerolls from Red Grief), but also lost one of their number to a lucky missile hit. Darn. At the end of my turn, I had scored Secure Objective 4 and First Blood for 2 points. In the Blood Angel turn, the Sons of Sanguinius got Aerial Assault, Secure Objective 1 and Defend Objective 4. I was reminded that deep strikers can still enter play on turn 1 in their own deployment zone, when the Sanguinary Guard, Librarian, Sanguinary Priest and, above all, Captain Smash came deep striking in front of the rock formation my Razorwing was on. Uh oh. The Stormraven flew up, looking to target my Jetbikes and various skimmers, and one of the close combat Scout squads near my deployment zone moved up, looking to assault my Ravager on Objective 4. Everything else stayed put, with the Primaris Lieutenant in particular standing at the back of his lines to give out rerolls and hold Objective 1, which was at the back of the board closest to his lines. In the psychic phase, the Librarian cast Unleash Rage, increasing his attacks and those of the Sanguinary Guard and characters all around him. He then followed up by trying to Smite the Razorwing, but failed. In the shooting phase, the Stormraven split its fire between the leftmost Venom, the Wych Raider and the Reavers; I used the Lightning Reflexes stratagem on the Raider, and as a result, almost all of the Stormraven’s shots missed or bounced off of flickerfields, although one unlucky Reaver was freemed by a lascannon hit. The Redemptor, meanwhile, fired both guns at my rightmost Venom. Despite its sheer volume of fire, however, it was hitting on 6s thanks to the damage it had taken and thanks to my Venom’s night shield, and the nimble little craft took no damage. Just when I thought I was getting off scot free, however, the Predator fired its lascannons at the same Venom, hitting it, doing an ungodly number of wounds to it and wrecking it in one volley, sending the Kabalites on board tumbling out. One unlucky Kabalite was killed in the wreckage. Finally, the Scouts in the building fired at the Raider, but again, thanks largely to Lightning Reflexes, did no damage. The Scout snipers close to my deployment zone, however, landed a missile hit on the Ravager on objective 4, and actually managed to do 5 wounds to the nimble skimmer. The close combat Scouts tried to add to the damage with their bolt pistols, but failed. The Sanguinary Guard, at least, managed to plink one or two wounds off of the Razorwing with their Angelus bolters. 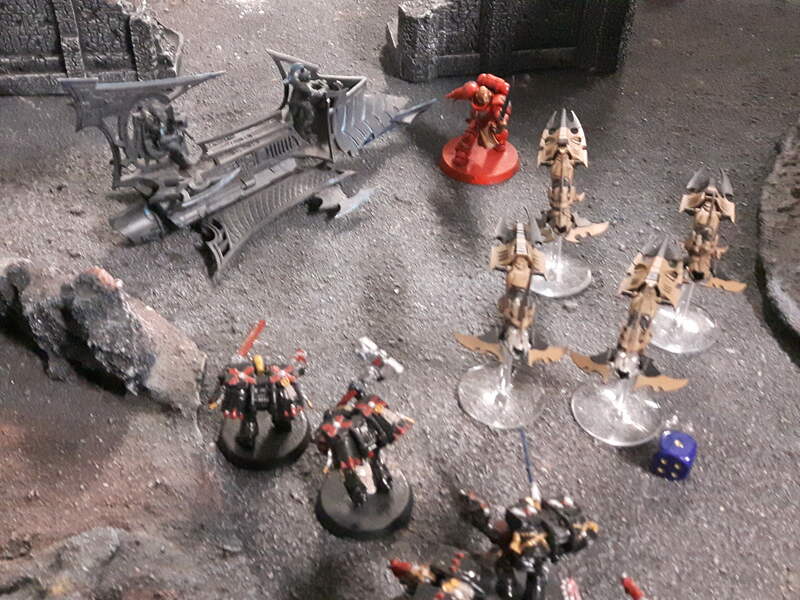 In the charge phase, Captain Smash charged the Razorwing, his Angel’s Wing negating overwatch, and the other characters and Sanguinary Guard followed him in. 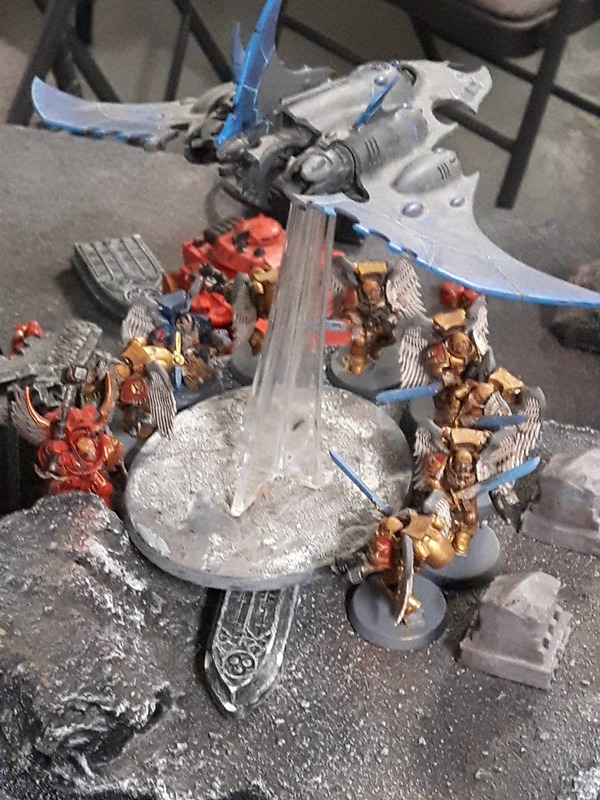 None of them even needed to roll, however, as Captain Smash easily inflicted 16 wounds by himself on the nimble plane, nearly destroying it twice over (I like to think that Smash slammed into the Razorwing from above and rode the flaming wreckage to the surface). As the wreckage tumbled to the earth, the Blood Angels deathstar consolidated in a cinematic way so they were all standing back-to-back on the plateau, in such a way that I could not reliably get any charging units into base contact with them. Suddenly, my plan of mobbing the Sanguinary Guard with Wyches and Grotesques didn’t look so sound after all, as I actually could not charge them! Elsewhere, the bold unit of melee Scouts charged the Ravager. Despite their Red Thirst, however, they either failed to wound the skimmer or bounced off its armour, though the Ravager’s bladevanes did nothing in return. Still, the Scouts were now set up to potentially gain Defend Objective 4 next turn thanks to their “objective secured” rule. At the end of their turn, the Blood Angels got Secure Objective 1 and Aerial Assault, tying the score between us. Amadeo winced as the Eldar jetfighter shrieked overhead, the bow-wave of its flight almost flattening him to the floor of the hab. The Drukhari were striking fast and hard, and already, their insidious weaponry had claimed grievous losses. He could almost hear the cruel laughter from the aliens’ skimmers as they darted to and fro amongst the buildings, spitting splinter and darklight fire into the Astartes positions as they closed in on the Blood Angels. Amadeo smiled, despite himself, as he heard a quick report on the vox from Captain Castivar. 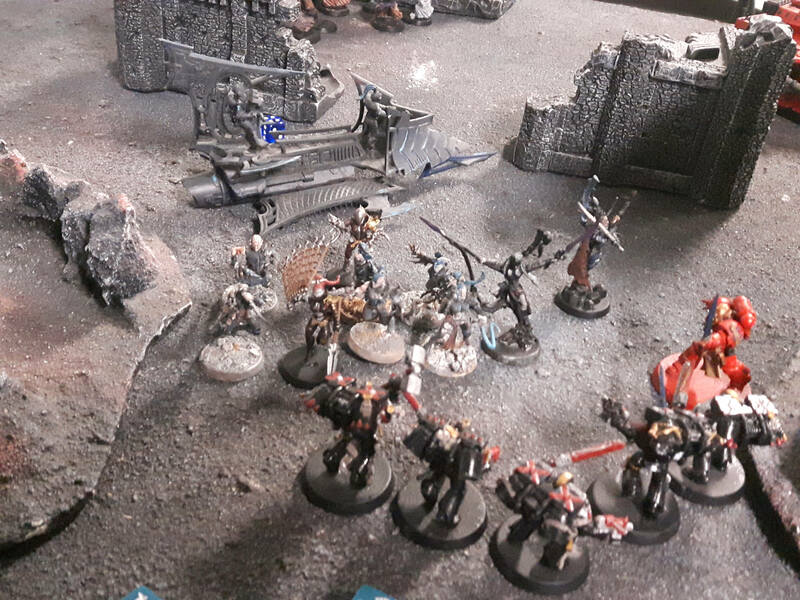 The Drukhari thought that they had run into a small, isolated force of the Astartes. They had but encountered the anvil…and the hammer would soon be upon them. The Razorwing’s hull caved downwards like a glass sculpture, shattering into thousands of tiny fragments even as the aircraft was consumed in a ball of flame. The armoured figure simply plummeted on through the explosion before striking the earth, his hammer thudding into a plateau with enough force to split rock. As the figure stood, bracing himself upright on his hammer, more figures descended next to him, their jetpacks forged in the shape of soaring angelic wings, their golden armour shimmering brilliantly in the firelight. “Always one for dramatic entrances, eh, Captain?” Amadeo muttered dryly. With me now unable to mob the Sanguinary Guard now that they were standing as they were on the plateau, however, I was forced to circle them instead, with my Reavers and Wych Raider skirting around into the Blood Angels’ backfield to shoot his Dreadnought and Predator from behind. (If only rear armour shots were still a thing). The Mandrakes, meanwhile, crawled out of Aelindrach, ready to face the nearby Scouts in the Blood Angels backfield. The damaged Ravager, flew out of combat with the Scouts, while my two remaining Venoms zoomed into rapid fire range to deal with these pesky Astartes noobs. Finally, the other Ravager shuffled a bit, as did the disembarked Warriors, and my Coven units continued their relentless advance forwards. I was hoping to tempt the Sanguinary Guard into a charge into my Grotesques: although I was fairly certain that the Guard would mess my wraithbone monsters up, I was also confident that the Grotesques would hold long enough for the Talos (and hopefully also my Wyches and characters) to join the fray. In the shooting phase, the Reavers split their fire, firing their blasters at the Redemptor in the hope of finishing it off, and their splinter rifles up into the Sanguinary Guard. Naturally, they whiffed against both targets– one of these days, maybe, my Reavers will actually kill something. The wounded Ravager was forced to do the deed itself, gutting the Redemptor with an accurate dark lance shot and leaving it a smoking wreck. Turning my attention to the Sanguinary Guard, my grounded Kabalites failed to damage them at all, but my Wych Raider picked up the slack, vaporizing two of the golden warriors with its disintegrator. Elsewhere, the other Ravager used Masters of the Shadowed Sky to get +1 to hit against the Stormraven…and hit once, and failed to wound. Sigh. Moving on. 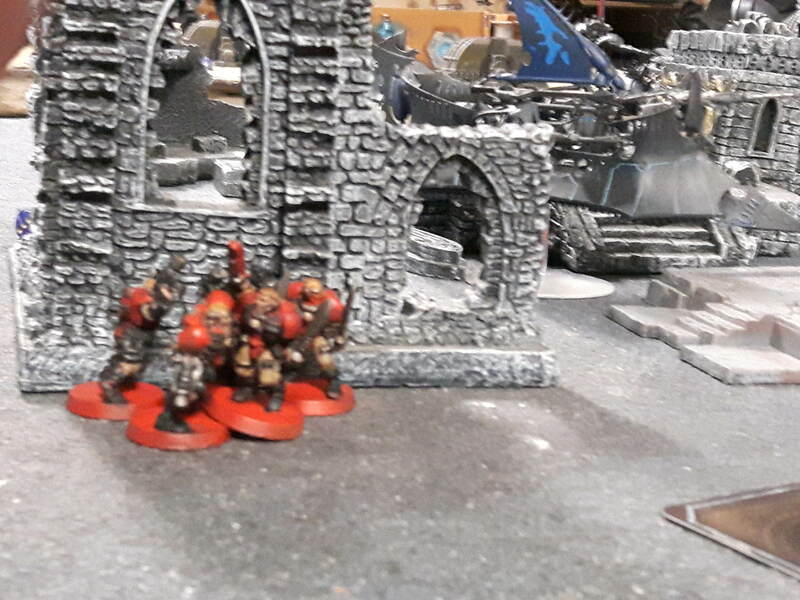 In the Blood Angel backfield, my Mandrakes unleashed their baleblasts into the rearmost Scout squad, scoring something like 9 or 10 wounds and obliterating them in fell swoop. Well done, creepy shadow dudes! In my own backfield, both of my Venoms, plus their crews, pumped shot after shot into the Blood Angel Scouts…only for the plucky Junior Marines to make save after save. After firing 36 splinter shots (rerolling 1s) and 2 blasters into the Scouts, I managed to kill 4 of them…leaving 1 of them very much alive and holding Objective 4, and with it a victory point. Argh! …until he failed his morale test on the Scout twice in a row, and the Scout spontaneously combusted on the spot. Oh. Well. That was anticlimactic, but I’m not complaining. At the end of my turn, I had only managed to achieve No Prisoners…and the d3 roll for my number of victory points from that stratagem came up as a 1. Despite a very effective shooting phase this turn, I had only managed to score one victory point. Harumph. In the Blood Angels turn, the Sons of Sanguinius discarded Defend Objective 4 and got Secure Objective 6, Valour of Angels and Noble Sacrifice. They must not have liked those Drukhari Reaver punks riding bikes in their backyard, as the Death Company disembarked from their Stormraven to go deal with them, as did the Primaris Lieutenant. 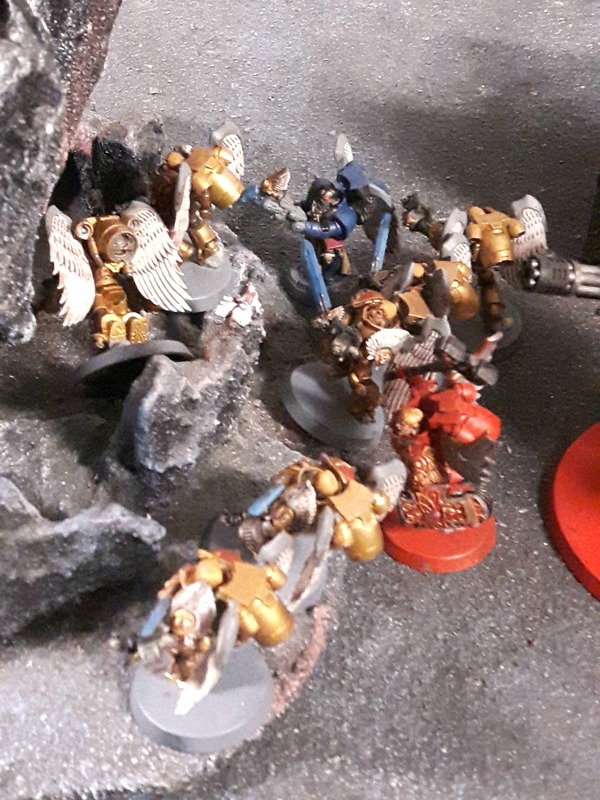 Meanwhile, the Sanguinary Guard had had enough of standing on a hilltop looking cinematic, and they, the Librarian, the Sanguinary Priest and Captain Smash all flew up to say hi to my Grotesques. Finally, the Stormraven hovered around to grab Objective 5 and shoot more of my stuff. In the psychic phase, the Librarian cast Unleash Rage, buffing himself and all of the Blood Angels around him. He then cast Smite on my Grotesques, and suffered perils, taking 2 wounds (after rerolling the result with a Command Point) but at the same time zapping down one of my Grotesques. In the shooting phase, the Sanguinary Guard and assembled characters combined to do 2 wounds to my Grotesques with assorted pistols and Angelus bolters. Further back, the Death Company and Lieutenant only managed to do 1 wound to the Reavers. The Stormraven once again split its fire, and wiped out my footslogging Kabalites with its hurricane bolters after I failed to make a single save. Its lascannons and multi-meltas, however, either failed to hit my Ravager, or bounced off of its flickerfield after some much better rolling on my part. The Predator fired on my Raider, but thanks to a combination of poor rolls and good saves, it only suffered 3 wounds from lascannon freemage. A unit of sniper Scouts tried their luck on the Raider as well, but failed to hit with their missile launcher. Finally, in my own backfield, the other unit of sniper Scouts once again fired on the wounded Ravager, and managed to plink another wound off of it. In charge phase, the Sanguinary Guard and accompanying characters charged into the Grotesques, with the dreaded Captain Smash rolling high enough to make base contact with the Haemonculus as well. The Death Company and Lieutenant, meanwhile, both charged the Reavers, shrugging off my overwatch in the process. (My opponent later told me that he had thought that my Raider could not actually be charged, on account of its Fly keyword, and hence did not multi-charge it even though he really could have). 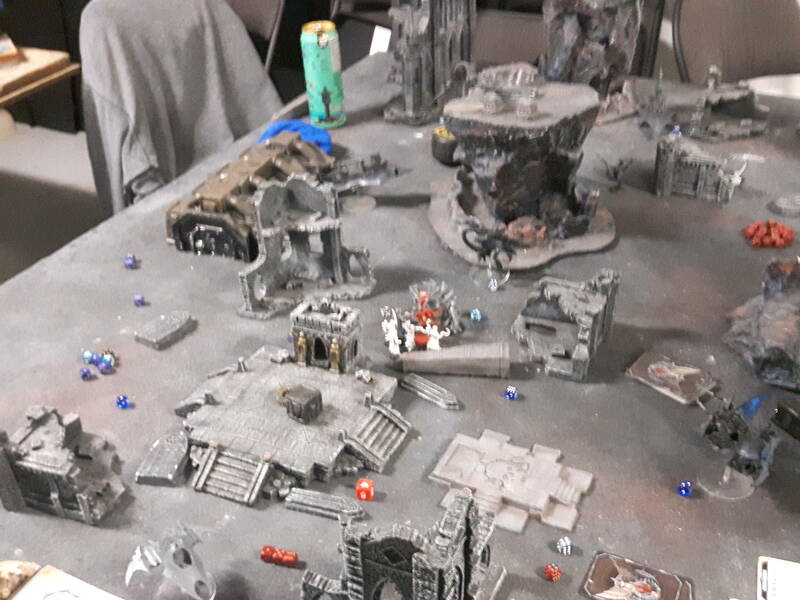 I anticipated that my Grots would take a lot of damage from the Blood Angel deathstar, and had two command points on standby in case they needed to auto-pass morale. In close combat, Captain Smash used Red Fury and split his attacks between Lazhareq and the Grotesques; however, my invulnerable saves and ignoring wounds from Power from Pain went into overdrive, and the Grotesques took no damage, although Lazhareq took a nasty hammer blow and was left teetering on one wound. The Haemonculus was quickly finished off by an axe-blow from the Librarian, while the Sanguinary Priest and Guard tore into the Grotesques, cutting down two of them and doing 3 wounds to another. In response, the Grotesques used their scalpels and unleashed an insane number of attacks of their own, cutting down three Sanguinary Guard and doing a wound each to the Sanguinary Priest and Captain Smash. Holy cow! Instead of taking massive losses like I had expected, my Grotesques had both held their ground and dealt a bloody nose to the Blood Angels in return. Clearly, I had underestimated my recently-converted wraithbone freaks. 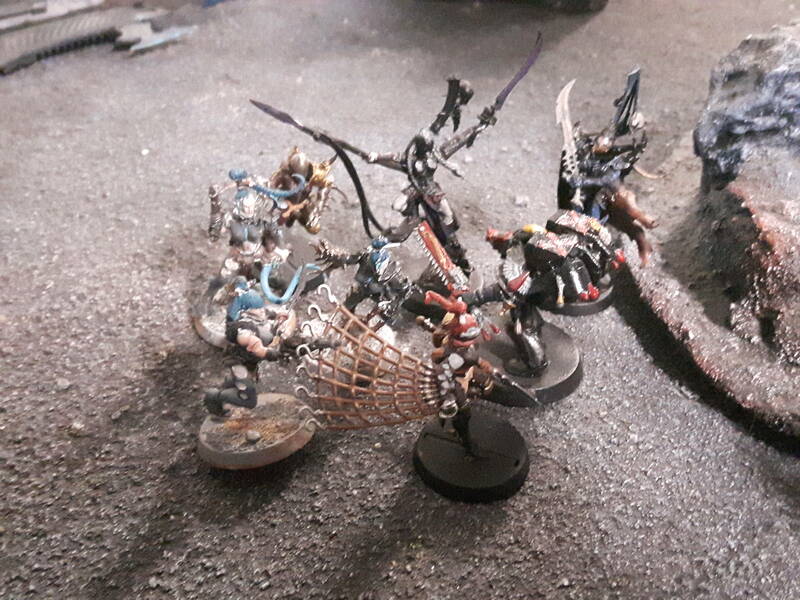 Elsewhere, the Death Company and Priest slammed into the Reavers with the force of an avalance, cutting down three of the nimble jetbikes for no loss. The last Reaver at that point decided he had better things to do, and fled the battle after failing his morale test. At the end of the turn, the Blood Angels suddenly scored a hefty surge of points, scoring 2 points from Valour of Angels (for killing my Haemonculus with Captain Smash) and 1 point for holding Objective 6 with the Stormraven. All of a sudden, I was losing. This turn, my entire army got +1 to hit in close combat thanks to Power from Pain. I drew Defend Objective 6, which was doable…provided that I managed to destroy the big, ugly Stormraven hovering directly above it. With the Blood Angels right at my doorstep, it would have been rude not to say hello: the Talos and Wracks moved up towards the big melee in the centre, while my Wyches, Succubus and Archon disembarked to deal with the Death Company. My healthy Ravager zoomed up towards Objective 6, hoping to kill the Stormraven and hold the objective for two turns, while my other Ravager and both Venoms zoomed around to bring their guns to bear on the Stormraven as well. The Mandrakes, in the Blood Angels backfield, moved up, hoping to grab Objective 1 next turn. In the shooting phase, the Mandrakes flung baleblasts at the Predator, and managed to do 2 mortal wounds to it. The Wyches and Succubus fired their pistols ineffectually at the Death Company, while Khyrus fired his blast pistol at point blank range into the Lieutenant…and rolled a 1 to wound. Obviously, the battery needed recharging. Everything else in my army focused fire on the Stormraven, with lances, blasters and splinter rounds shooting up at the big flying brick. In the end, I managed to reduce the Stormraven to 3 wounds, but it was still airborne, and still denying my Objective 6. Darnit. In the charge phase, the Wyches charged the Death Company, and lost 2 to surprisingly accurate overwatch before making it in, and were quickly joined by Karath. Khyrus, meanwhile, charged the Lieutenant to see if Primaris Marines were as tough as GW said they were. 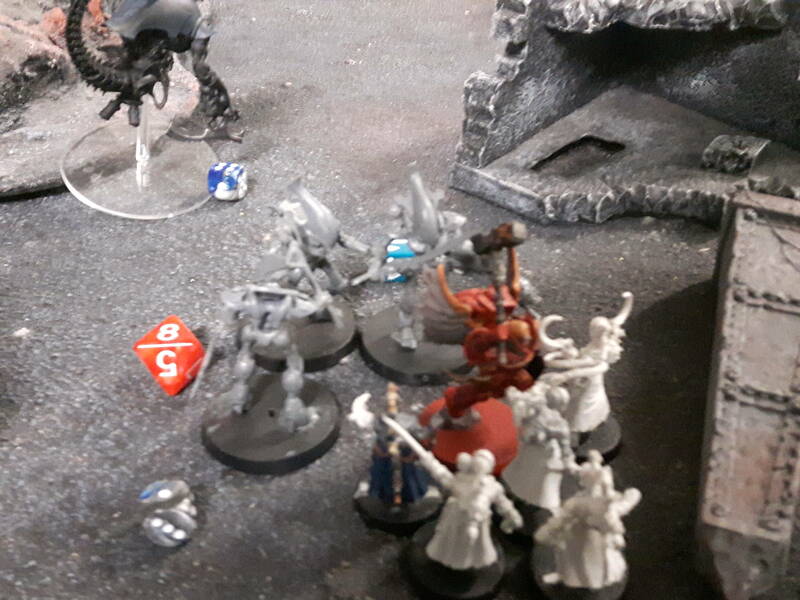 Elsewhere, the Talos charged into the Blood Angels Librarian, and the Wracks, not having much better to do, flung themselves at Captain Smash in the hopes of avenging their fallen master. In close combat, Khyrus drove his Djinn Blade into the Lieutenant’s heart and killed him outright, before consolidating into the Death Company. The Wyches managed to cut down two of the berzerking Marines, while Karath managed to slice down two more, leaving one frothing madman whose return blows were easily dodged by the Wyches. In the big central combat, the Talos flung itself onto the Librarian and bisected him horribly with its macro-scalpels, killing him…and giving my opponent a point thanks to Noble Sacrifice! Um…whoops. My Wracks also managed to poke a wound off of Captain Smash. 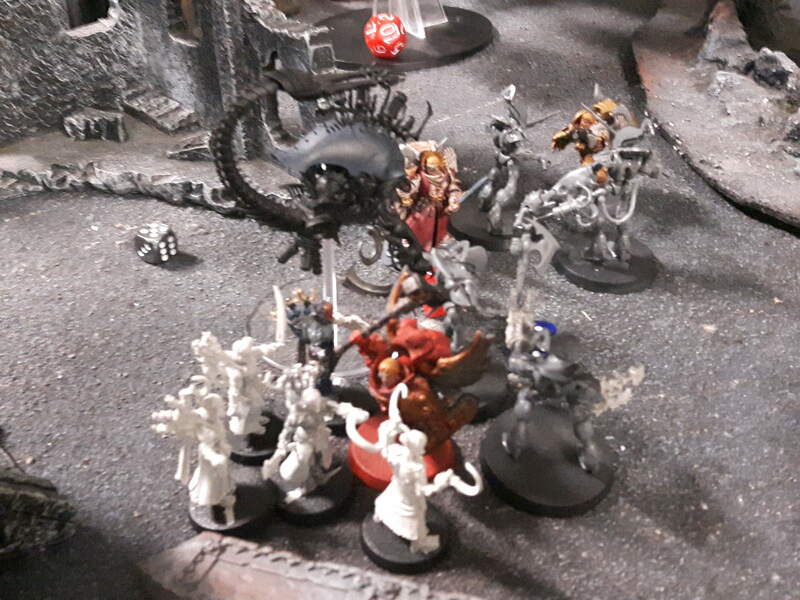 In the rest of the fight, the Sanguinary Priest managed to hack down the wounded Grotesque, while Captain Smash smashed three wounds off of another, the corrupted Wraithguard saved only by Power from Pain. In exchange, the Grotesques managed to kill another Sanguinary Guard and did another wound to Captain Smash, and the combat dragged on. This turn, though, I had managed to score none of my tactical objectives, much to my frustration. In their turn, the Blood Angels drew Mission Critical Objective 1 (uh oh) and a few other things I can’t remember. 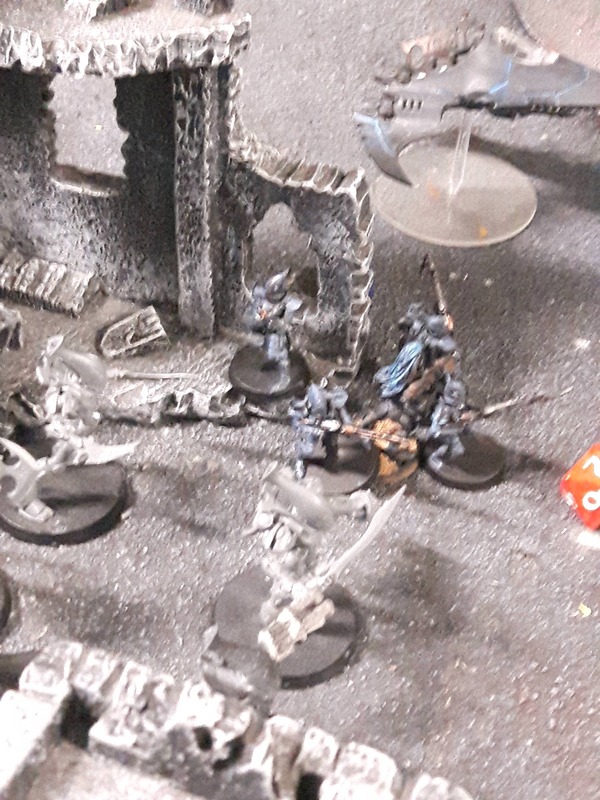 Surrounded on all sides by Wyches and Drukhari heroes, the last Death Company Marine had a sudden burst of sanity and fled combat (despite my Wyches and despite their shardnet! ), flying over to grab Objective 1. The damaged Stormraven, meanwhile, came flying into the backfield, hovering behind my Wyches so that my Archon was the closest model to it. Everything else, at this point, was either in close combat or was holding still to fire heavy weapons. In the shooting phase, the Stormraven fired everything it had into Khyrus. Despite the fact that it was hitting on 5s, its hurricane bolters still did 3 wounds to the Archon..and naturally, the first of his shadow field saves came up as a 1. Staggering from three bolt wounds, Khyrus nonetheless laughed and nonchalantly asked the pitiful mon-keigh if that was all they had. 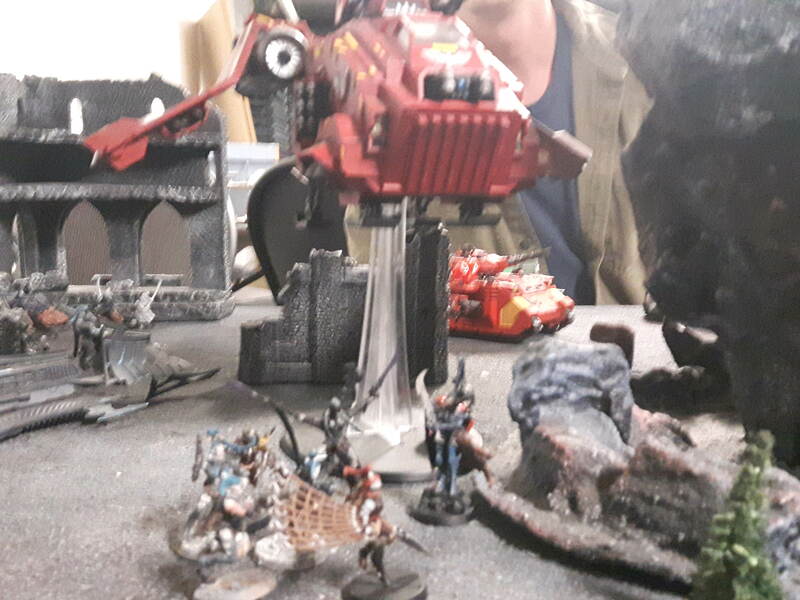 The Stomraven answered with a direct multi-melta hit that turned Khyrus into free-floating vapour, netting the Blood Angels Slay the Warlord. The Blood Angel shooting didn’t end there, though. Seeing that my Succubus was also the closest target, the Predator focused all of its shooting on Karath. This time, however, my dice saved me, and Karath elegantly dodged all of the lascannon blasts. The nearby Scouts, at least, managed to snipe and frag missile down two Wyches. The other Scouts tried to knock out one of the Venoms, and once again either missed or failed to wound. In close combat, the Talos once again put its scalpel-arms to grisly work, hacking apart the Sanguinary Priest. In response, Captain Smash killed another Grotesque, while the Grotesques cut down the last of the Sanguinary Guard, and the Wracks once again stabbed a wound off of Captain Smash. After consolidation, Captain Smash now found himself alone and surrounded by Grotesques and Wracks; the Talos was unable to get into base contact with Smash, and thus was freed from combat. In the end of the turn, another Wych was lost to morale. The Blood Angels got Critical Objective 1, but only rolled a 1 for their victory points. Still, at this point, their lead had increased significantly. 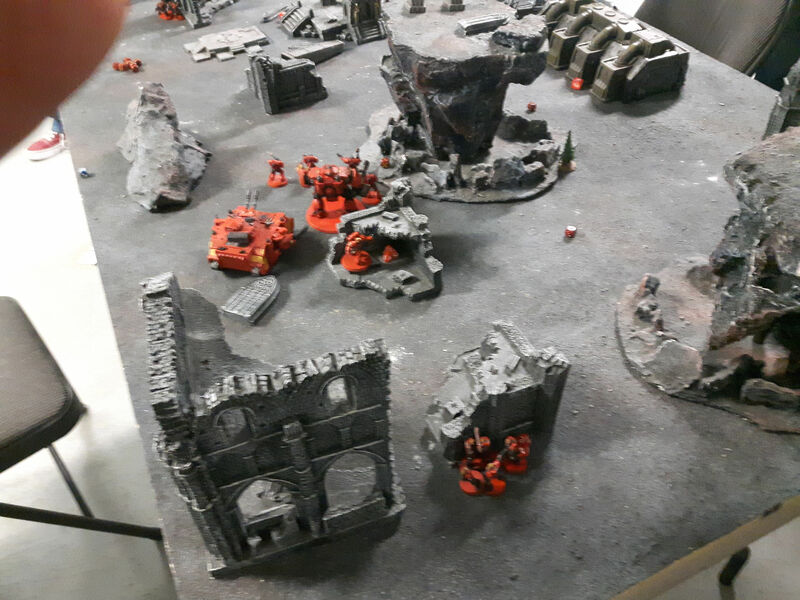 I was now afraid that I was going to out-fight the Blood Angels, but still lose the game on points. This turn, my entire army would be auto-passing morale thanks to Power from Pain. I got Scour the Skies. My leftmost Ravager stayed where it was on objective 6, while my Venoms each went after one of the Blood Angel Scout squads. Karath and her last Wyches moved after the Predator, while the Mandrakes crept towards the last Death Company Marine on Objective 1. Unable to get at Captain Smash now that he was surrounded, the Talos simply shrugged and hovered past the combat to add its haywire blaster to the mix against either the Stomraven or the Predator. In the shooting phase, my healthy Ravager once again fired at the Stormraven. This time, I managed to hit the flying red brick and do 6 wounds to it, finally bringing it crashing down in a blaze. Everything else– the damaged Ravager, the Talos, the Raider and the Mandrakes– all fired into the Predator and dropped it down to 2 wounds. On the left flank, one Venom, hovering on a rock formation for leverage, fired along with its passengers into the Scouts on the upper floor of the ruins, but only managed to kill two of them. 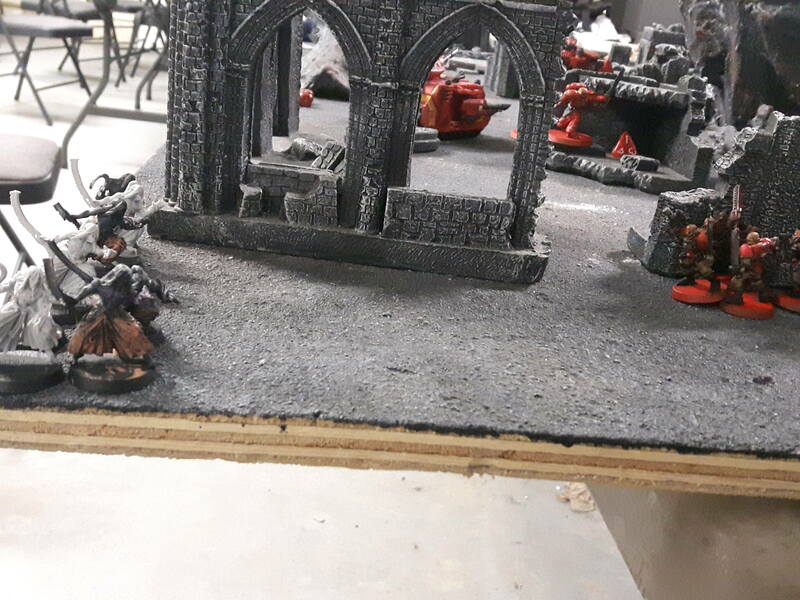 On the right flank, the other Venom and its crew fired at the Scouts in my backfield…and this time, the Blood Angels must have forgotten to wear their armour, as all 5 were mowed down in a hail of splinters. In close combat, the Mandrakes charged the last Death Company Marine, while the Wyches and Karath charged the Predator, losing two to surprisingly accurate overwatch on the way in. In close combat, the Mandrakes tore the last Death Company Marine limb from limb and took Objective 1, while Karath put her Blood Glaive to good use and sliced open the Predator before butchering the crew within. In the ongoing central close combat, the Grotesques laid into Captain Smash with their flesh gauntlets…and did no damage whatsoever, the one mortal wound they scored being ignored by Death Visions of Sanguinius. The Wracks, similarly, failed to take Smash’s last wound, and in return, Smash did what Smash did best and smashed down another Grotesque. Thanks to Power from Pain, the Grotesques simply fought on without worrying about morale. By the end of my turn, I had achieved Scour the Skies, Critical Objective 1 (for which, sadly, I rolled only a 1), and was well on my way to achieving Defend Objective 6. I was still behind on points, but the Blood Angels didn’t have much left on the field. In the Blood Angels turn, the last Scouts held their ground, and, seemingly knowing that things were counting on them, fired on the Ravager on objective 6 and did 4 wounds to it with a krak missile. 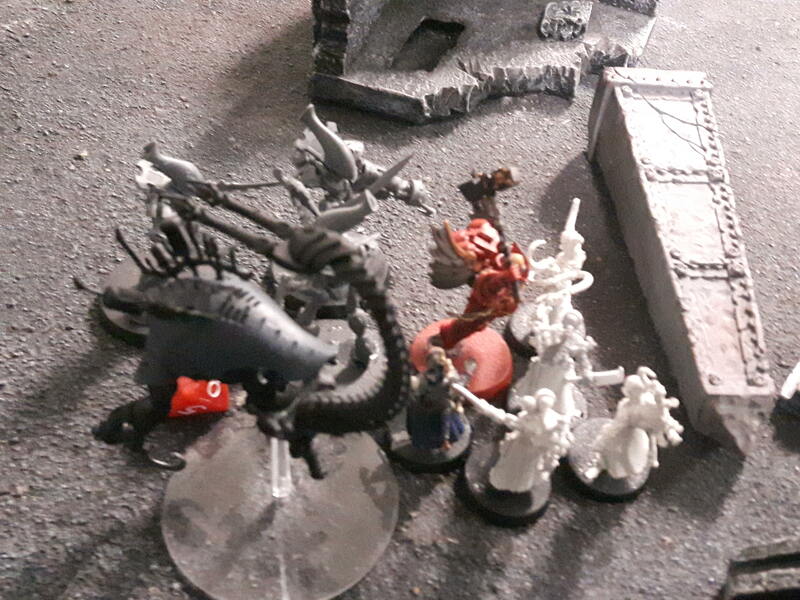 With that short shooting phase out of the way, we went on to combat: Smash once again laid into the Grotesques, and smashed down another of the wraithbone monstrosities, leaving only two left to fight him. In reply, the Grotesques once again attacked with their flesh gauntlets…and this time, managed to inflict a mortal wound on him that he couldn’t ignore. The mighty Blood Angels Captain finally dropped, convulsing and twisting as the flesh gauntlet warped his body. However, at this point, my opponent recognized that with only three Scouts left, he was likely to be tabled next round, and formally conceded the game. VICTORY TO THE KABAL OF THE REVENANT SHROUD! Going into the battle, I wanted to try to tie down/neutralize his Sanguinary Guard as soon as possible instead of allow them free reign to move around. Unfortunately, I wasn’t able to do too much damage to them before they slammed into my Grotesques. What ultimately saved me was the Grotesques themselves: I had underestimated not just how resilient those bad boys were (and to be fair, 4 wounds each at toughness 5/6, a 4+ invulnerable save and ignoring wounds on 6s is nothing to sneeze at), but how much pain they can dish out in close combat: by turn 3, they were dishing out 5 attacks each, hitting on 2s, wounding on 3s and forcing -2 to the Blood Angels’ saves (all for a ludicrously cheap price– at 35 points each, they are cheaper than thunder hammmer/storm shield Terminators!) These things are absolutely mean, possibly the nastiest close combat unit in the Drukhari book (other than Talos), and I would not be surprised if they received some sort of points hike in the next big FAQ. Looking back, my opponent made several crucial errors, the most notable being sticking his Hellblasters at the front of his force, out in the open. Even if he had been going first, I would still have been in a position to focus my return fire on them and wipe them out as soon as possible– and I would have done so, given how scary their plasma weapons are. Also, although Captain Smash managed to kill quite a few of my Grotesques, I think he would have been put to better use flying around on his own and charging my vehicles– not only would I have been unable to overwatch him, but he would have had a large threat range thanks to Descent of Angels/Upon Wings of Fire, and his insane damage output would have meant he’d have been able to annihilate any vehicle of mine he charged. If he had ignored my Grotesques and used his mobility to chase down and kill my vehicles (and particularly my Ravagers), the game would have gone much differently. Alternatively, if he had sent his Death Company in alongside his Sanguinary Guard, maybe the fight in the centre would have ended differently. Overall, though, I’m quite pleased with the performance of most of my army– my Grotesques amazed me on their first outing, the Talos similarly performed decently, my Mandrakes once again cleaned out the enemy backfield, and my firepower once again was impressive– even in a force not designed to optimize firepower, I was able to reliably destroy or maul my opponent’s units with concentrated firepower. Only my Reavers, once again, died without accomplishing much. I’m beginning to wonder if I should replace them with something else, or if it’s simply their aggressive play style that causes them to get shot down so early. I should also note that my opponent was a really fun guy to play against, and he kept his head up and kept playing for objectives even as his army took heavy losses. I literally had to focus on tabling him just to avoid losing on points. I definitely look forward to the possibility of facing him again. Amadeo ducked as another round of splinters scythed across the abandoned hab-unit’s ledge, crystalline impacts sending rock fragments shattering in all directions, granite shards stabbing into his cheeks and temple. Shrugging off the minor injuries, he gripped his rifle and checked over his squad. Artan was dead, lying against the wall near him, his body bloated and discoloured under his armour after he had been riddled by poisoned Drukhari splinters. 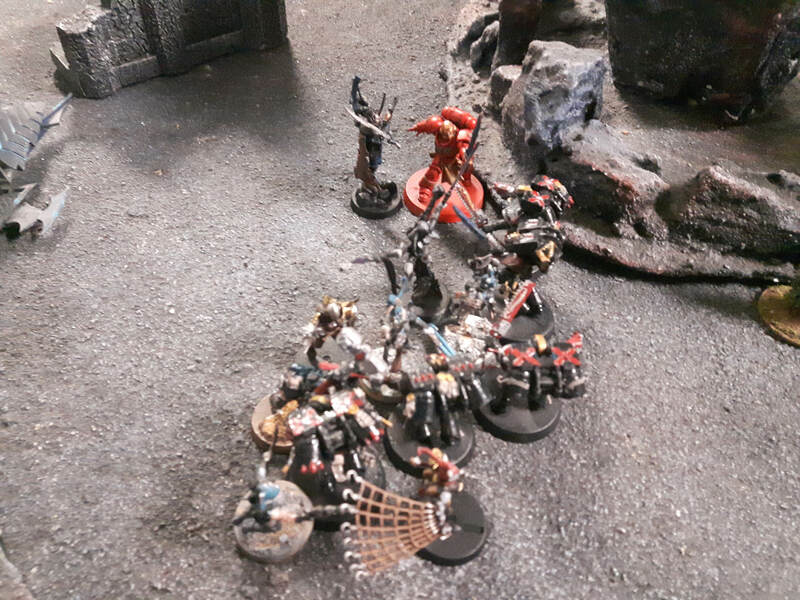 Morleus was wounded, with Tyrio and Vigilio fighting to stabilize their brother as his wounded shoulder rapidly became infected from the Drukhari toxins. But that was nothing compared to the scene unfolding on the city streets below them. The battle was lost: though the Sons of Sanguinius had struck with with all of the speed and the fury they were renowned for, the ever-mobile Drukhari had been able to regroup quickly and respond in kind. Little by little, the battle had gone against them: Venerable Brother Sanctian had been sundered by xenos darklight weapons, his Redemptor chassis now slumped over in a smoking wreck; the strike force’s Stormraven had been brought down in a ball of flame, even after its passengers, the Forlorn Hope of the Death Company, had died to a man. 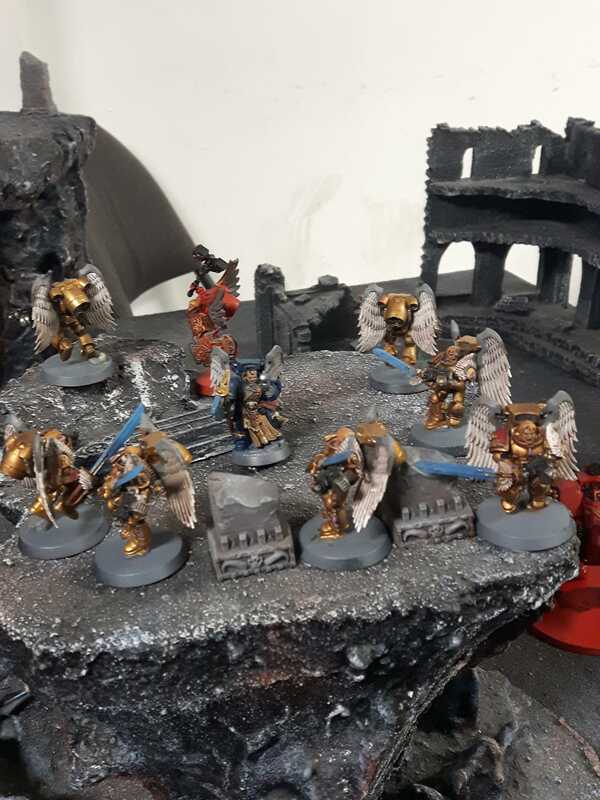 The Sanguinary Guard– the golden heirs of Azkaellon, the finest warriors of the chapter– had reaped a terrible toll upon the Drukhari, but in the end they too had been laid low by xenos blades. Amadeo could see their bodies littering the field, their armour a dull bronze under the weeping grey sky. Only Captain Castivar remained standing, fighting alone in the grip of the Black Rage while surrounded on all sides by twisted wraithbone monstrosities. The Captain fought like Sanguinius himself, a red tempest of motion as his thunder hammer described great golden arcs back and forth, each blow sundering one of the xenos constructs with a thunder-crack of shattering wraithbone and a terrible, almost ghostly death-wail. For a moment, Castivar seemed invincible, the towering forms of the Drukhari constructs falling one by one to his crackling hammer, forming a mound around him as he fought with all of the rage of of his bloodline. That is, until one of the xenos constructs stabbed a long, spike-tipped arm below Castivar’s pauldron. The Captain jolted at the wound, the fury suddenly leaving his eyes as his hammer fell from his numb gauntlets. As Amadeo watched in horror, Castivar toppled over, his body starting to convulse as black veins crawled up his throat and spread tattoo-like across his face. Amadeo turned his head away. He could not bear to see what happened next. All was lost. He felt a deep well of sorrow build within him– a sorrow soon twisted into the deepest, blackest rage. Tyrio looked like he was going to argue at first, but instead he gave a slow, solemn, nod. As he and Vigilio began to rappel down the side of the building with Artan held between them, Amadeo turned back to the carnage of the battle site, the details lost in the increasing blur of his vision. He closed his eyes and dropped his rifle, surrendering at long last to the curse that had been building inside of him these past few weeks. This entry was posted in Battle Report, Dark Eldar, Warhammer 40k and tagged Battle Report, Blood Angels, Drukhari, Warhammer 40k. Bookmark the permalink. A most pleasant read! Loved the setting of the battle. I bet it was a lot of work to write (and remember!) all of this but you did it justice and, as a Drukhari player myself, I really liked reading it. I need more ! !